The Newest Rant: "SP4RX" is a Rollicking Good Read! 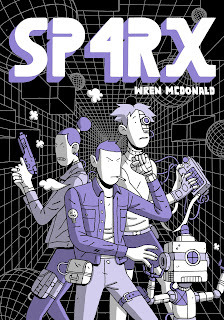 I read, "SP4RX," by writer and artist Wren McDonald (published by Nobrow) and found it to be a really good time. Set in a miserable future full of class-stratification, "SP4RX," features our protagonist--the title character--navigating this world and teaming-up with some hackers as it becomes clear a seemingly helpful program for citizens called the, "Elpis Program," which is a computer chip of sorts installed in the brain, may not be so harmless. I quite enjoyed this book but there were three things I absolutely loved about it. First off, the artwork is amazing. 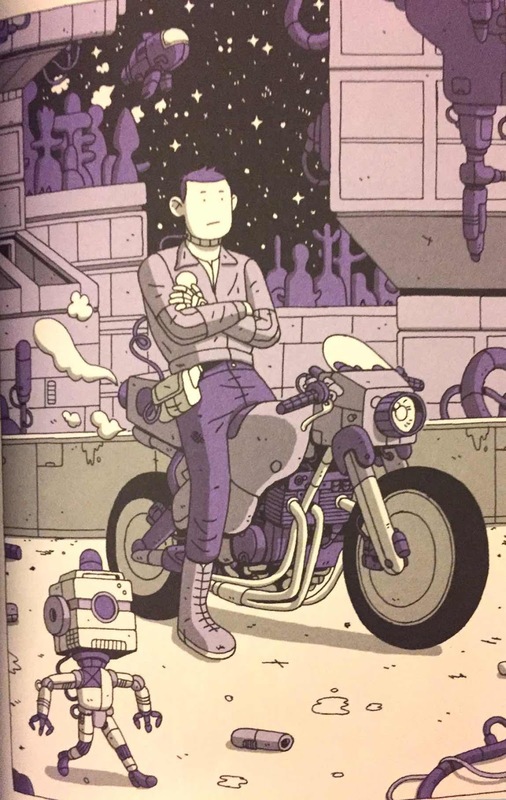 Wren McDonald both write and illustrates this comic, and the style is a delightful mixture of fanciful sci-fi and grim reality as our protagonist wanders between different, "Worlds," of the poor, middle-class, and rich. 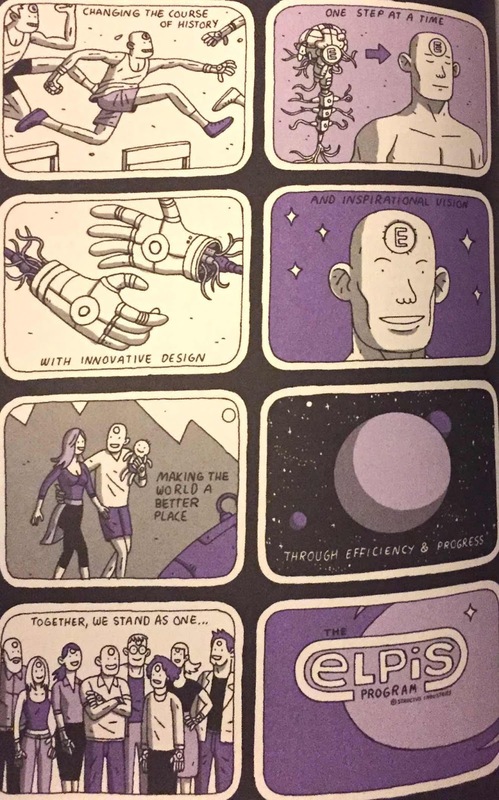 Plus, the robots always look great. As for the second thing I loved, I was pleased how SP4RX is presented not as some predestined savoir for the hackers he ends-up joining to fight against the, "Elpis," program, he is just some random guy who is good at hacking and fighting that ends-up being in the right place at the right time on a couple of occasions. The third thing I adored was the clever way the Elpis Program itself is presented in the story. Sold to the local population as a way to keep yourself awake and working, the Elpis Program is a, "Free," way for the lower and middle-class population to dedicate themselves to working harder and theoretically making a enough money to become higher-class citizens. Basically this program is a Randian wet-dream where the rich give the poor a tool to work harder under the auspices it will help the impoverished, but at the end of the day the rich just get richer--as always. The secret to the Elpis Program however is that it has some hidden code that also can turn anyone with it installed into a murderous monster. Through appealing to the hopes of the poor and the greed of the rich the (obviously evil) company behind the Elpis Program can get it put into countless desperate people and then make them turn-on and kill on another so as to, "Eliminate," any riff-raff. 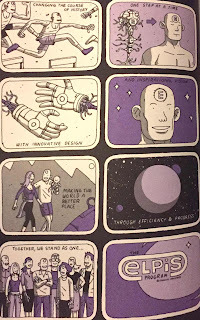 The Elpis Program helps make it so that , "SP4RX," creates a dark commentary on our current world and where it could end-up, as the best kind of science-fiction should do! Were I to have any complaints, it would be that while SP4RX himself is a purely capable person, we don't learn too much about what makes him tick, why he lives the life he does, and things of that nature. We see how SPR4X helps others, but never really learn why he chooses to do so. Still, even if SP4RX isn't the most well-developed character, the world he lives in is fascinating enough to make-up for that flaw. Note: I requested a copy of, "SP4RX," from the publisher, NoBrow, for the purposes of review. I was provided the book but no other compensation or incentive was given to review it in any way other than honestly and with my true opinion.